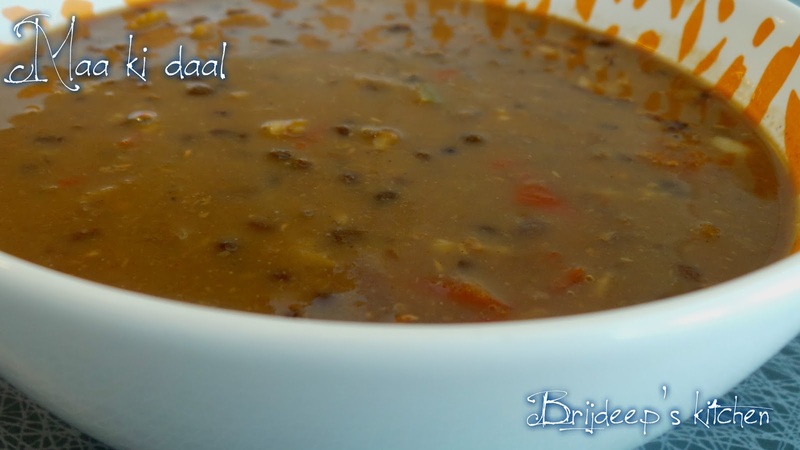 Maa ki dal (typically called maah di daal) or kaali daal is a typical recipe made in Punjabi households and this recipe my dear, has always been very much famous in my home. 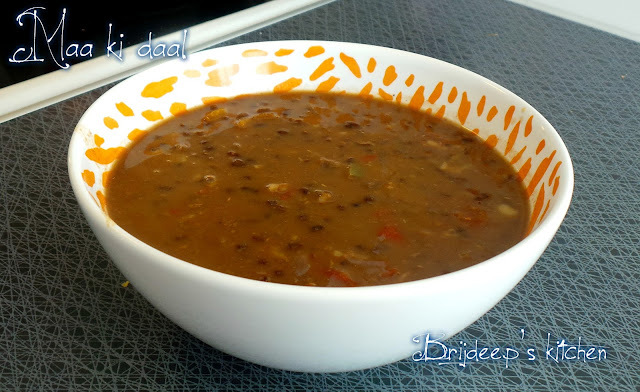 This is a very simple version of dal, unlike the Dal Makhani recipe, there is no butter, ghee, cream, cashews, spices etc. 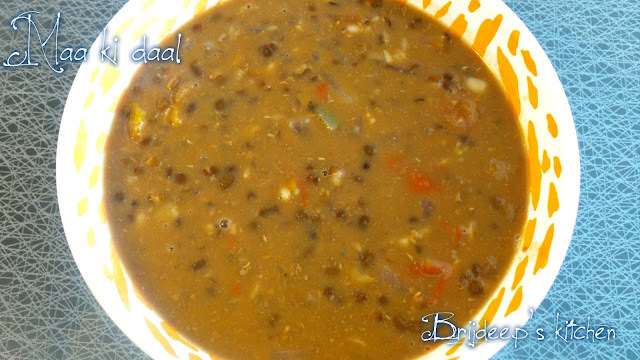 added in this recipe and this is a perfect homely recipe made only using black whole lentils, simmered in a simple masala and served without any garnish and served with simple garam garam ghee wali chappati. My Nani has a saying about this dal in my home which goes like: "Maah di daal, te hove do ghee chupdi rotti naal" !! (Black lentils with two ghee smeared chappatis is a heaven!). 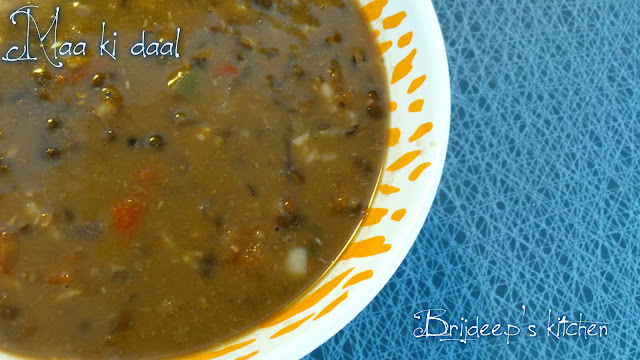 Here's the recipe for maa ki daal/ black lentils soup..
Soak the black whole lentils in water for 6-8 hours or overnight. Wash thoroughly and drain the water in which the lentils were soaked. Pressure cook for 8-10 whistles with salt or until soft. Heat oil in a pan and crackle the cumin seeds. As they crackle, add the asafoetida. Add the onion and ginger and fry the onions until they are transparent. Add the garlic and fry for about 2 minutes. Add the tomatoes and green chili and sprinkle salt. Mix well and let cook until the tomatoes are soft and mushy. Add the red chili and turmeric powder and mix well. Turn off the flame after 2 minutes. Add this masala to the boiled dal and simmer for about 15 minutes. Turn off the flame and serve hot. This dal is best served with simple chappatis smeared with ghee. Please do not add any garam masala or any other masala. This simple, homely flavor is actually the specialty of this dish without and added spices. 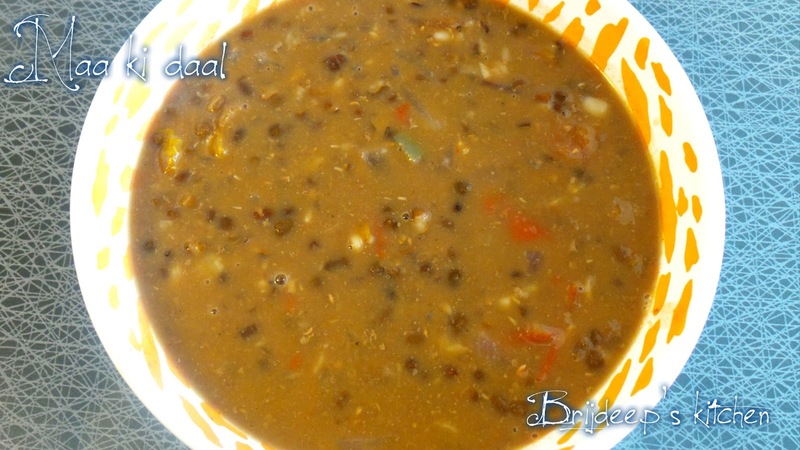 Ideally this dal is also not garnished with anything and savored in its simple form. Loved this recipe? Please do leave a comment/feedback in the comments section below as it really motivates me and don't forget to like my Facebook Page for more regular yummy updates.